We planted our winter compost crop seed mix this week. The seeds arrived last week (from Bountiful Gardens), but because the ground was frozen we had to wait for warmer weather. There is a mixture of vetch, wheat, and rye, and then the fava beans are planted separately. We’ve never done this before and are not exactly sure what to expect. Will it look like just a bunch of weeds growing? And it seems strange to plan to grow stuff, just to cut it down and leave it in the dirt. I understand the concept and the experts say it’s a good idea, so the only way to fully understand it is to do it. We also sprinkled Dutch White Clover seeds on the backyard areas with less grass which, hopefully, will expand throughout the yard. Shooting real firearms in suburbia isn’t very convenient, plus winter is frequently cold and wet when you go to the range, and ammunition quickly gets expensive. So I’m going to try using airsoft guns as an alternative way to practice and teach shooting skills. I got the idea from listening to Jack Spirko’s TSP, Becoming a Better Shooter and Trainer with Airsoft Guns (Episode 671). 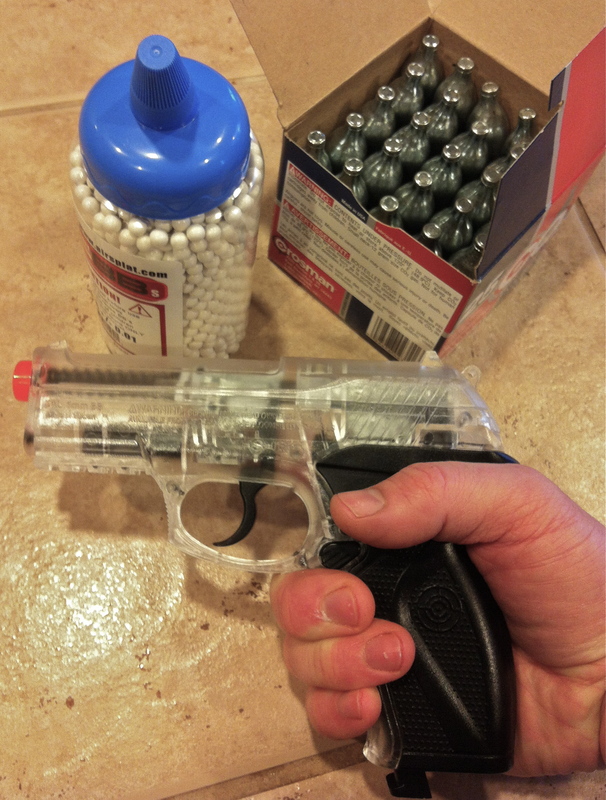 Last week Ryan and I went and bought a Crossman Air Mag C11 CO2 pistol, a box of CO2 cartridges, and a 2000 pellets (total cost less than $100). We came home and built a frame (8 1/2 by 11 inches), with a plywood back, lined the inside with a towel (to absorb the impact and prevent ricochet), and tacked up a normal piece of paper with a target drawn on it. We hung it on the wall and paced off ten feet. Sarah, Ryan, Alison, Emily and I took turns shooting in our custom indoor-range. I think it will be a good cost and time-saving, teaching and practice tool. Of course it’s not the real thing, but it’s the right weight and size and it allows you to practice: stance, grip/hand placement, sight alignment and sight picture, and trigger control. About the only thing missing is the loud “bang” and recoil. I’m excited about this new training venue. Once we get our skills up to a good level, we can–since it’s not a real gun and can be shot in the house–practice some “what if a stranger breaks into the house” scenarios. I think this will be a good winter activity that will allow any and all of us, who want to shoot, to have almost unlimited practice. December 1st was yesterday. 2011 is almost over. Now is the time to reflect on our 2011 goals and either hurry up and finish, or revise as necessary. My post the last Friday of this month/year will be: What I Did This Year To Prep. Then, in early January, I’ll write: Goals For 2012. I’d encourage you to reflect back on this year and start thinking about your goals for next year. Lastly, I wanted to link to some follow-up information regarding antibiotics in our long-term preps. 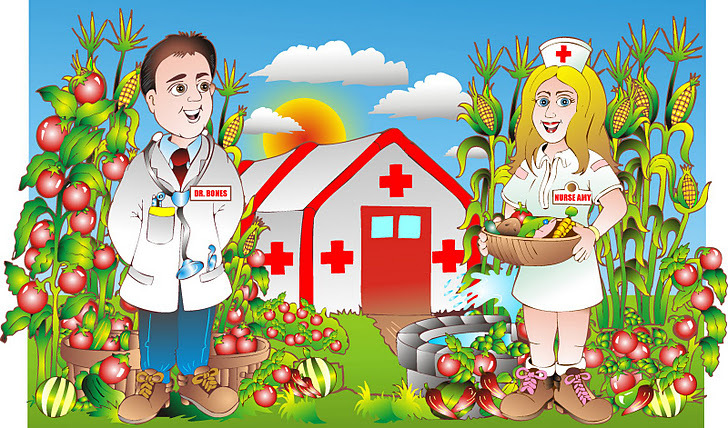 From The Doom and Bloom Hour blog with Dr. Bones, a medical doctor, and his wife Nurse Amy, a Nurse Practitioner: Antibiotics And Their Use In Collapse Medicine, Part 1 and Antibiotics And Their Use In Collapse Medicine, Part 2. I applaud this couple for their diligence and determination to share life-saving material about collapse medicine. It is difficult to get good information on this topic and they are my top resource. No one plans to trip and fall–especially not to fall and get hurt–but we do. It happens faster than we can say “oops”. Most of the time we quickly (or slowly) get back up, check to ensure all our parts still work, and somewhat sheepishly go on. But sometimes you either can’t get up, or it really hurts when you do. A little while back I was thinking how difficult it would be to get around in a collapse situation with a leg injury. Trying to improvise crutches or a cane, though doable, wouldn’t be ideal. So we decided to purchase (from a thrift store) a set of crutches, a cane, and a wheelchair. So far we’ve got the crutches and a cane, hanging neatly in a corner of the garage. 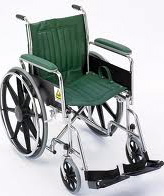 We haven’t found a decent wheelchair for good price yet, but when we do it’ll be folded down and hung with the others. When an injury first happens, especially if it looks serious, everyone available helps and cares for the injured. But in the days afterward, the injury is mostly forgotten by everyone except the injured. He (or she) now has to get around and function as best they can. Injuries such as sprains and strains* are rarely crippling, but they make even minimal walking painful and difficult. Having that set of crutches or a cane (though a cane is easier to improvise, storing one takes almost no space) allows a patient to be ambulatory and more independent. In addition a wheelchair, for someone who can’t even get around on crutches, would be invaluable. Remember we’re discussing a situation where there is no other medical assistance available; a situation where you only have what you have. This doesn’t have to be just a collapse situation. What about an injury during an ice or snow storm where it’s difficult to get out, or to have an ambulance respond? How much easier would it be if you had what was needed to allow your patient to be ambulatory? Then, when care is available, hang it back up until it’s needed again – they’re reusable. Ryan is currently healing from an injury of his own. His involves the collar-bone and shoulder region (bike crash), so it doesn’t limit him walking around. But I was reminded how long those type of injuries take to heal, the pain associated with them, and the inconveniences they cause doing simple day-to-day activities. The other thing I plan to add to our medical preps is a folding military-style stretcher. I thought about this again when I read Dr. Bones’ post, Thoughts on Patient Transport. A stretcher is in a somewhat different category since it’s used to carry an injured person, and may not be as necessary because it can be improvised. But we know that people are going to get hurt and that they are going to need to be moved; so we may as well prepare for it. I know this isn’t brain surgery, but frequently we don’t think about preparing for medical injuries beyond having a first aid kit. As I’ve stressed before, in a collapse situation people who aren’t used to physical exertion will be forced to be much more active and injuries will happen – and they will happen more frequently. *A sprain is an injury to a ligament (in a joint), i.e. 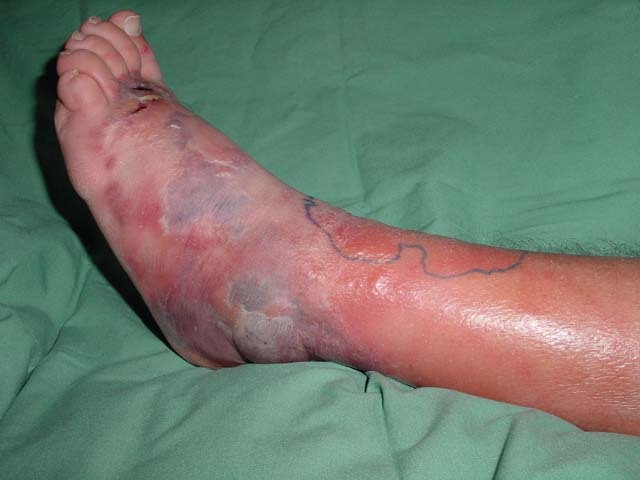 sprained ankle; a strain (aka as ‘pulled’) is an injury to a tendon or muscle, i.e. strained, or pulled, hamstring). For first aid treatment, remember the mnemonic: P.R.I.C.E. – protect, rest, ice, compress, elevate. Crutches, a cane, or a wheelchair will help protect the injured extremity by not putting weight on it, and allow it to rest by using it as little as possible. Last week in Soap and Water I posted about the risk, in a collapse situation, of an infection–from minor cuts and scrapes–known as cellulitis. I linked to Dr. Bones Doom and Bloom blog post, Cellulitis: An Epidemic in a Collapse. 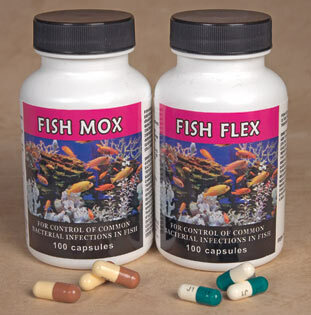 Here’s another good article by Dr. Bones, A Doctor’s Thoughts on Antibiotics, Expiration Dates, and TEOTWAWKI. For additional perspective about antibiotics before and during a collapse I recommend comments by Dr. ‘Walker’ on TSP forum. Additional, non-prepper/collapse, antibiotic information can be found at eMedicineHealth.com. I need to state, though I was previously certified and worked as a paramedic for almost ten years, I am currently not a medical professional of any type; thus I am not giving any professional medical advice. All the information in this post is from open internet sources. As Dr. Bones states “. . . [these] are hypothetical strategies for a post-apocalyptic setting. They are not meant to replace standard care and advice when modern medical technology and resources are available.” And always remember, the practice of medicine or dentistry without a license is illegal and punishable by law. Antibiotics do not fight infections caused by viruses, such as: colds, flu, most coughs, and most sore throats (unless caused by strep). As discussed in Soap and Water, describing a collapse situation, there are several things that will aggravate the chances of getting an infection: 1) We will be doing more ‘dirty’ jobs, 2) We will be doing a lot more manual labor and other activities that can easily lead to cuts and scrapes, and 3) Clean water and basic hygiene will not be as accessible or convenient. So a relatively minor wound that is ignored while you continue working gets more contaminated; then the wound isn’t thoroughly washed out because clean water is saved for drinking. In a short period of time that wound can develop a serious infection. 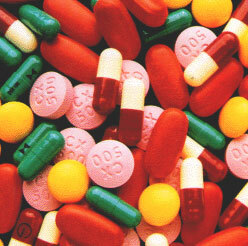 Having antibiotics available in a collapse situation will be very important, even lifesaving. The question is how can we as preppers obtain a stockpile to be used if other ‘medical resources’ are no longer available? For any medication you choose to stock (antibiotics or otherwise) print out the entire drug card and keep that information stored with the drug; a good online source of drug information is the U.S. National Library of Medicine. Also it’s always best to store them in the original package and, like food storage, keep in a dry, dark, cool place. * There are many other good references available, these are just two examples. There is no reason to buy a current edition; older editions are much cheaper and have essentially all the information a layperson would ever need.